On July 3rd, 2017, the ResilientAfrica Network (RAN) enrolled a total of 31 students as student interns. The students come from various universities including Makerere University, Kyambogo University, International Health Sciences University in Uganda and Makerere University Business School and are currently either in their second or third year of studies, pursuing courses in Engineering, Social Sciences, Computer Science, Information Technology, Business Computing, Journalism and Communications among others. 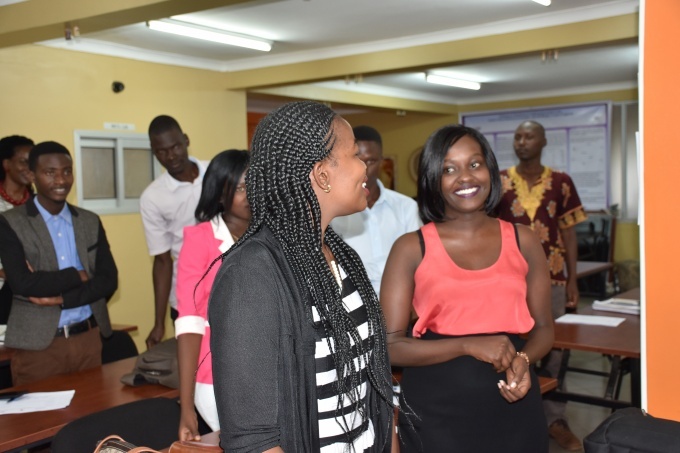 The students benefited from an induction day to kick start their time at RAN, which is expected to last for nine weeks starting July 3rd to August 19, 2017 at the Eastern Africa Resilience Innovation Lab (EA RILab). The induction was attended by 18 students including one Volunteer. To get the ball rolling, Natasha Kassami, RAN’s Engagement Officer led the students through sharing their expectations. The interns voiced the following expectations for their time at RAN: They expected to further their skills in research, learn more about networking, creativity and innovating, make friends for further development and growth, physically engage and utilize some of the innovative solutions under incubation at RAN, appreciate the evaluation process of innovative ideas, turn their own ideas into reality and learn how innovation grants are put out and implemented to mention but a few. Natasha also highlighted RAN’s expectations which included among others; commitment to fully utilizing all opportunities which present to individuals or groups of people, creativity and innovativeness from all students. flexibility. The interns also listened to presentations delivered by the RAN Secretariat and EA RILab team. The presentations included: an overview of the RAN network and the EA RILab which is hosting the students, an introduction to the work of the Multimedia, Research, Innovations, Communications and Engagement Departments at RAN. Dr. Julius Ssentongo, Program Coordinator-RAN Eastern Africa Resilience Innovation Lab, Eng. Ronald Kayiwa, Innovations Officer, Joseph Mukaawa, Multimedia Developer, Brian Ndyaguma, In-Charge Innovations Scaling at RAN and Harriet Adong, Communications Manager comprised the team which engaged the interns during the half day induction session. Some of the key takeaways noted by interns during the induction meeting were: The fact that RAN’s EA RILab focuses on addressing shocks and stresses related to climate change and chronic conflict, the RAN team is working to support identification, development and scaling of resilience innovations to address specific community challenges, RAN’s Mission, Vision, Objectives and Core Values, the need to “always use the right channels to reach the intended audiences”, as mentioned by Harriet Adong and the need to set expectations, goals and targets to achieve over the internship program. On the whole, the session was very interactive, as the students were given a chance to actively participate in sharing their ideas, comments and responding to questions from fellow students and different RAN staff. In a one-on-one with Keziah Mwenkanya, a student intern from Makerere University, she shared her dream of developing several applications in support of the communities in need, networking and becoming one of the most highly ranked innovators and spoke of how she was “on the verge of seeing this dream come to reality” through the opportunity offered to her by RAN. She noted, ‘I am excited that I am one of those few selected to join the RAN students’ internship program and I look forward to learning and sharing new skills and ideas to help me achieve my dream’. Ms. Harriet Adong, RAN Communications Manager among other things shared with the student interns that such opportunities like the internship program are aimed at offering training which is relevant and implementable to guide their future. Socially, she also reminded this group of students to avoid the use of in-descent language both in the office and outside but also the need to maintain a decent and smart dress code as RAN ambassadors working towards uplifting RAN’s image. ‘Never take anything in life for granted, remain flexible to learn, strive to make the best out of all opportunities and always be a value add to the team you are working with,’ she added. Read more about the RAN Internship Program on http://www.ranlab.org/?s=Internship.